PowerPoint for Office 365 can transcribe your words as you present and display them on-screen as captions in the same language you are speaking, or as subtitles translated to another language. This can help accommodate individuals in the audience who may be deaf or hard of hearing, or more familiar with another language, respectively. There are also position, size, color, and other appearance options for the captions and subtitles to accommodate different environments and audience needs. For best results, we highly recommend using a headset microphone connected to the device running PowerPoint. Also, the feature requires a reliable internet connection throughout your presentation. You can choose which language you want to speak while presenting, and which language the caption/subtitle text should be shown in (i.e. if you want it to be translated). You can select the specific microphone you want to be used (if there is more than one microphone connected to your device), the position where the subtitles appear on the screen (bottom or top, and overlaid or separate from slide), and other display options. 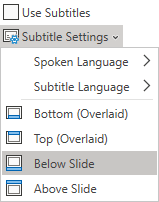 On the Slide Show ribbon tab, select Subtitle Settings. Or, you can adjust the settings without leaving your presentation through the context menu, Slide Show or Presenter View menus > Subtitle Settings > More Settings. 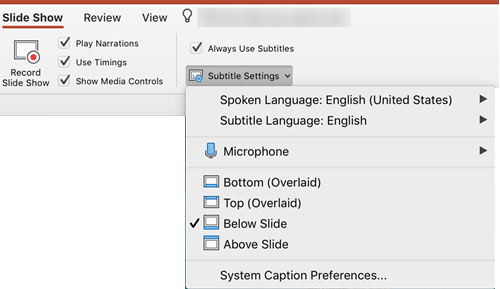 Use Subtitle Language to see which languages PowerPoint can display on-screen as captions or subtitles, and select the one you want. This is the language of the text that will be shown to your audience. By default, this will be the same language as your Spoken Language, but it can be a different language, meaning that translation will occur. In the Subtitle Settings menu, set the desired position of the captions or subtitles. They can appear over the top or bottom margin of the slide (overlaid), or they can appear above the top or below the bottom of the slide (docked). The default setting is Below Slide. More appearance settings are available by clicking Subtitle Settings > More Settings (Windows). You can change the color, size, transparency, and font style of the subtitles. You can change the background to improve contrast and make text easier to read. You can also toggle subtitles from the right-click menu, or with the shortcut key J. 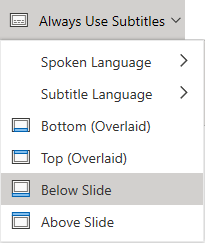 To have subtitles always start up when a Slide Show presentation starts, from the ribbon you can navigate to Slide Show > Always Use Subtitles to turn this feature on for all presentations. (By default, it's off.) Then, in Slide Show and Presenter View, a live transcription of your words will appear on-screen. On the Slide Show ribbon tab, select Subtitle Settings. More appearance settings are available by clicking Subtitle Settings > System Caption Preferences. Currently, this feature is only available to Targeted Release users of Office 365. You can choose which language you want to speak while presenting, and which language the caption/subtitle text should be shown in (i.e., if you want it to be translated). You can also select whether subtitles appear at the top or bottom of the screen. (Simplifed Ribbon) On the View ribbon tab, click the drop-down arrow next to Use Subtitles to open the menu of options. (Classic Ribbon) On the View ribbon tab, select Use Subtitles. Then click Use Subtitles to open the menu of options. Set the desired position of the captions or subtitles: they can appear overlaid at the top or bottom margin of the slide. The default setting is Bottom (Overlaid). To have subtitles always start up when a Slide Show is presented, select View > Use Subtitles. Several spoken languages are supported as voice input to live captions & subtitles in PowerPoint for Office 365. The languages marked as Preview are offered in advance of full support, and generally will have somewhat lower accuracy, which will improve over time. * "Preview Languages" are not as fully supported at this time. Our recognition of these languages will improve over time. PowerPoint live captions & subtitles is one of the cloud-enhanced features in Office 365 and is powered by Microsoft Speech Services. Your speech utterances will be sent to Microsoft to provide you with this service. For more information, see Make Office Work Smarter for You.